Boucherouite refers to a form of rag from rural areas of Morocco created from wool, cotton, synthetic fibers, Lurex, Nylon and plastic. Changes to these materials began in the 1960's and 70's. What is especially unique about them is the wild poetry of their compositions; they are part of and beyond a tradition from no one region. Thus, the rugs are woven in a creative, improvisatory style by the weavers whose choice of colors and textures gives the rugs the feeling of painting. They are a new cultural form created from necessity meeting personal aesthetics. The world is naturally postmodern, however, the supreme intention of these artists is utilitarian. In a very odd way, these pieces are a liberation from tradition, while at the same time that they uphold it. But there are no rules, and there is no way to look at a rug, and pinpoint exactly where it comes from. They are Pan-Moroccan. 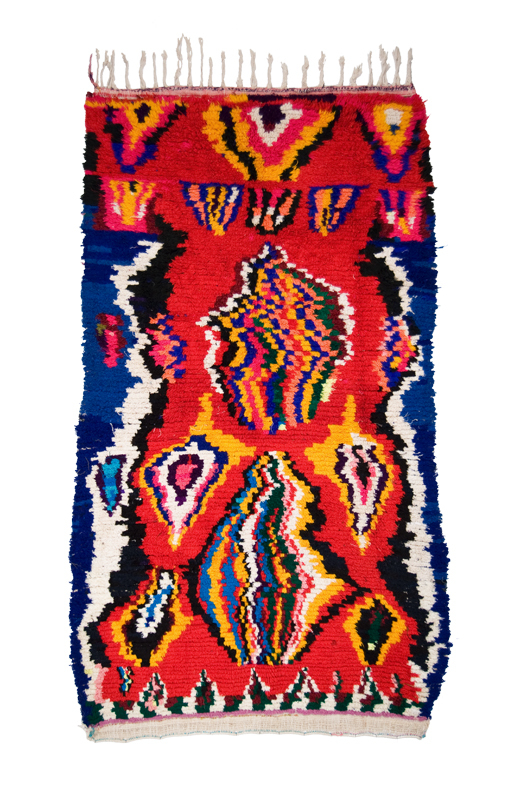 There is a quiet but very important side bar to these rugs, as well. They are made by women. They are a declaration of creative freedom by Amazigh women. They are personal visions of inner and outer gender topography uncapped by male participation. They are wordless and soundless and inchoate. Yet they are visually musical. They have rhythms and anti rhythms, syncopation and improvisation dictating abstract moods by the saw-edged mixtures of colors. They are inner landscapes. They unpack the essences of female Place. Cavin-Morris is pleased to introduce these to the New York art community in collaboration with Gebhart Blazek.